For centuries, mapmakers, astronomers and navigators had no shared reference point from which to measure global space. While the longitudinal line that passes through Greenwich, England had by the late eighteenth century become a commonly used prime meridian for navigators, dozens of prime meridians were in active use throughout the nineteenth century for the purposes of cartography, geodesy, and time-reckoning. There were other serious contenders for global prime meridian as well, from El Hierro (Ferro) in the Canary Islands to Paris to Jerusalem. Multiple meridians continued to remain in use several decades after the 1884 International Meridian Conference held in Washington, D.C., an event that was long understood, erroneously, to have marked the moment when all “civilized” nations agreed to put aside local practices of measuring space and time in favor of a universal, cosmopolitan system with Greenwich as global zero. This story has been told before, but never with such rigorous attention to detail as Charles W. J. Withers, Geographer Royal for Scotland, brings to it in his book, Zero Degrees. Withers proceeds chronologically from the age of Ptolemy, who used Ferro as Prime Meridian because it marked the absolute Western limit of known space for the Ancient Greeks, to the early decades of the twentieth century, during which time Greenwich eventually outlasted other contenders to become global prime meridian. While the selection of Greenwich is often represented as an historical inevitability exemplifying triumphant rationalism in the face of national partisanship, Withers takes historical alternatives to Greenwich seriously, thereby substantially enriching and complicating our understanding of the debates around the prime meridian and their significance for the emergence of geography itself as a global science. For example, while most historians would relegate to the status of a footnoted curiosity the fiery and messianic rhetoric of the nineteenth century Scottish Astronomer Charles Piazzi-Smyth, Withers understands Piazzi-Smyth’s advocacy of the Great Pyramid of Giza as prime meridian to be part of a “formative context over competing metrologies” and thus to contribute meaningfully to “long-running narratives over different standards, precision, uniformity and accuracy: the very ‘stuff’ out of which science emerged in this period” (p. 136). Withers does a fantastic job of bringing many of the major and minor players of this story to life through careful and creative archival research. It is fascinating, for example, to read excerpts of letters by Jules Janssen, the eminent French astronomer and delegate to the 1884 Washington conference, who wrote home to his wife in Paris between conference sessions about his having sweat so profusely during his impassioned speech against the Greenwich meridian that it took his shirt “two days to dry” (p. 201). The book’s greatest strength is the extent to which it delves into such archival minutia of the conferences and debates involving European men of science like Janssen, who early on saw the far-reaching importance of what many of their contemporaries understood to be fairly arcane and specialized concerns. Much of this material has never been analyzed at length in any existing historical scholarship. Withers, however, by “descend[ing] into a necessary detail” (p. 20) in documenting these scientific debates, at the same time does a disservice to his story. The eventual dominance of the Greenwich meridian in literally ruling the lives of the entire world’s population is a story ultimately involving a much larger group of people than a handful of European mapmakers and astronomers, many of whom endeavored pointedly in their debates to keep broader public and civil uses of Greenwich separate from their own specially delimited scientific practices. The “universal day” advocated in Washington, for example, was diplomatically distinguished from local timekeeping in the wording of Resolution IV, according to which the “universal day […] shall not interfere with the use of local or other standard times” (Withers, p. 205). How then did Greenwich become the universal regulator of space and time in civil life around the world when so many of these nineteenth century men of science (the iconoclastic and largely marginalized Canadian time-reformer Sandford Fleming excepted) insisted so carefully on keeping the use of Greenwich limited to very specific scientific and navigational practices? The answer, as Withers acknowledges late in the book, is that it happened as a result of larger “mechanisms of modernity” like the telegraph and the railways that were “working to unify the world in terms of timekeeping” but were “broadly independent of the Washington conference” (p. 220). When Withers’s narrative extends past the 1884 Washington conference, it would then seem appropriate that his lens would widen in order to more broadly contextualize the specialized scientific debates that have been his focus within the larger sweep of these more impactful transformations of modernity. Instead, Withers misses that opportunity by keeping his focus narrow as he charts the discussion among astronomers in various nations in regards to a recommendation from Washington (Resolution VI) that the astronomical day begin at midnight rather than noon. As Withers correctly indicates at the end of that discussion, however, the move to unify civil time had very little to do with such scientific debates. “By and large” he writes, the move for uniformity in public time-keeping “was untouched by the specialist concerns of astronomers and navigators over projected adjustments to nautical ephemerides and the demands for international agreement on Resolution VI.” (p. 255) Keeping the focus of his narrative restricted to those specialized debates among a subset of European scientists, then, Withers in a sense loses focus on what is most enduring and transformational in the story he is telling. In addition, focusing on a cast of almost entirely white European men in the story, as Withers does, also downplays how much arrogance and hubris were involved in events like the Washington conference of 1884. It should never go unquestioned and unchallenged, for example, that the person representing “India” at that event was Richard Strachey, a Somerset born veteran of the Anglo-Sikh wars, which crucially enabled the East India Company to suppress and subjugate the Sikh kingdom. In my own reading of the Washington conference in “The Cosmic Time of Empire” (2011), I tried to find ways to read against the grain of these self-entitled white European men of science who so glibly attempted to legislate a “proper” means of measuring global space and time on behalf of the world’s population. A key figure for me at Washington was the only non-European, non-Christian delegate in attendance, a man listed in the conference protocols only as “Rustem Effendi” who was representing not only Turkey but also the Ottoman Empire and by extension the greater Muslim world in the nineteenth century. His impassioned and lengthy speech in defense of the practices and needs of agrarian communities is one of the highlights of the 1884 conference for me, gesturing as it does towards a world of cultural, economic, and social experience outside of the orbit of “civilized” European imperial nation-states. Yet Rustem’s speech is represented in Withers’s chapter-long account of the conference with only this summation: “brief exchanges on universal time and local timekeeping practices followed” (p. 213). 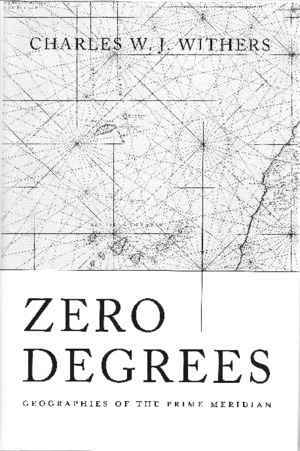 Zero Degrees may be the most detailed and exhaustive historical account of the prime meridian yet published, but more of the story remains to be told. Adam Barrows: Rezension zu: Withers, Charles W. J.: Zero Degrees. Geographies of the Prime Meridian. Cambridge, MA 2017 , in: Connections. A Journal for Historians and Area Specialists, 01.03.2019, <www.connections.clio-online.net/publicationreview/id/rezbuecher-29837>.